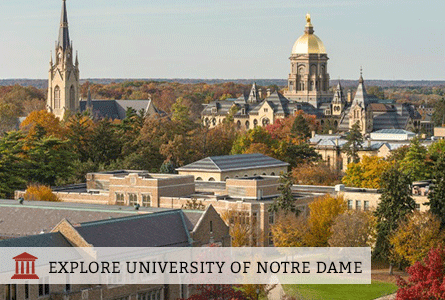 University of Notre Dame is an independent Catholic university located in South Bend, Indiana that offers more than 70 degree programs ranging from International Economics to Neuroscience and Behavior. All incoming students enter the First Year of Studies program, where they receive close support from a full-time professional advisor who will prepare them for their intended major. Education at Notre Dame has always been linked to community service. 85% of students are active in service through Notre Dame’s Center for Social Concerns. Undergraduates also participate in Social Concerns Seminars, courses that allow students to spend fall, winter, or spring break traveling to various locations and addressing social topics in the context of that environment. In addition to their involvement in service, students also take part in more than 400 student clubs and organizations, support the University’s Division I athletic teams at sporting events, and enjoy the scenic campus and its surrounding community. Fun fact: Founded in 1845, the Band of the Fighting Irish is the oldest college marching band in continual existence and has more than 380 members.